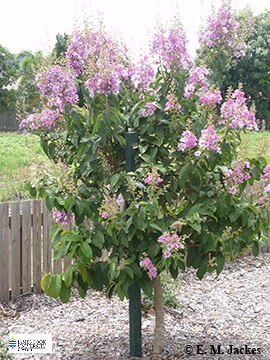 This tree which originated in Asia is most attractive when flowering. The trunk is twisted or sinewy in appearance with thin, pale bark. The leaves are simple and prominently veined, old leaves turn red or rusty-coloured before falling. The inflorescence is an erect panicle with numerous pink flowers, the 5 separate petals are crinkly. The globular woody capsules (about 2 cm diameter) are often used in floral arrangements.